“Wait till the honeying of the lune, love! Die eve, little eve, die!” Telmetale of Stobhach Gaelach, Guinness and Lady Galadriel. A few words from Finnegans Wake and we’re off. Last night, Bloomsday evening fell, along with the one hundredth anniversary of Dubliners reaching the world, the amazing short story collection from Mr. Joyce featuring “The Dead,” and its mesmerizing final lines, “His soul swooned slowly as he heard the snow falling faintly through the universe and faintly falling, like the descent of their last end, upon all the living and the dead.” No better place to learn how to craft a sentence worthy of being alive. 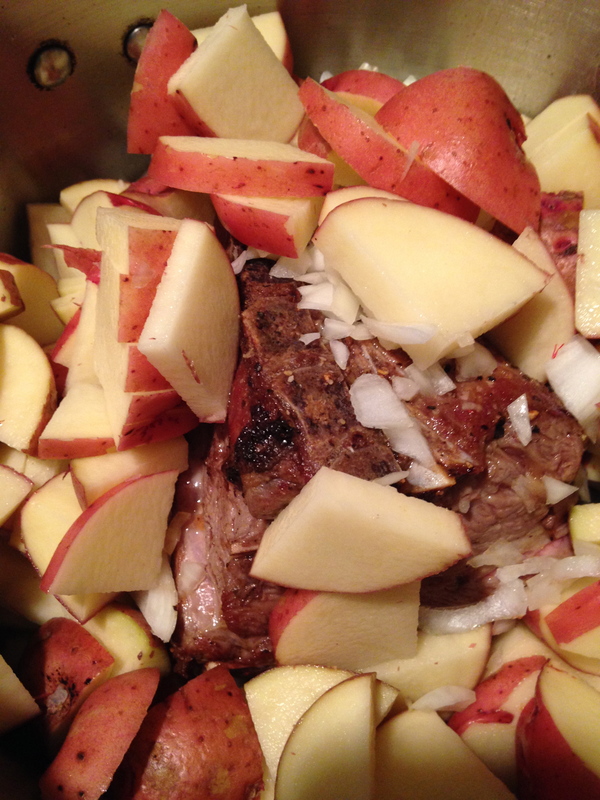 And in keeping with being and living, time to fabricate and shape an Irish Stew. Stobhach Gaelach, stobhach meaning “stew” and gaelach translated as “Irish,”pronounced sthuv-ukh gway-lukh. 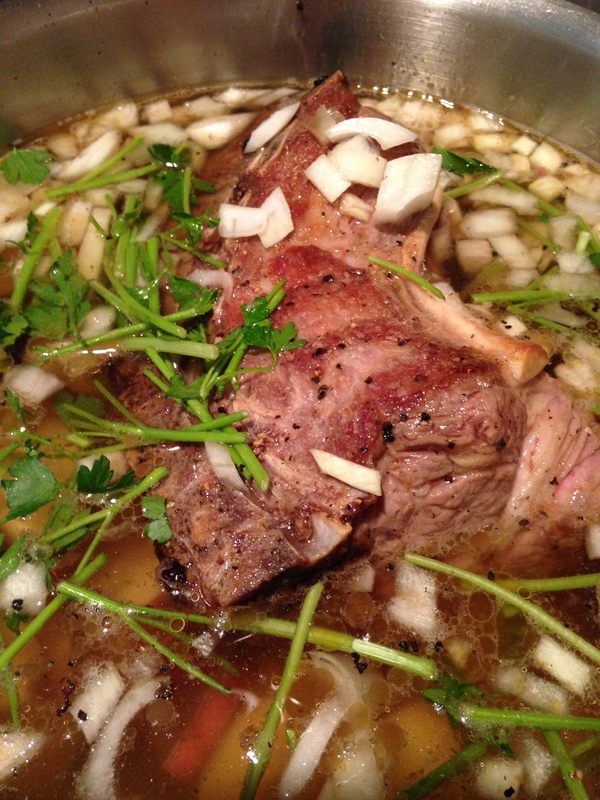 I’m using an old, stripped-down recipe calling for mutton or lamb, onions, potatoes and parsley. That’s it. 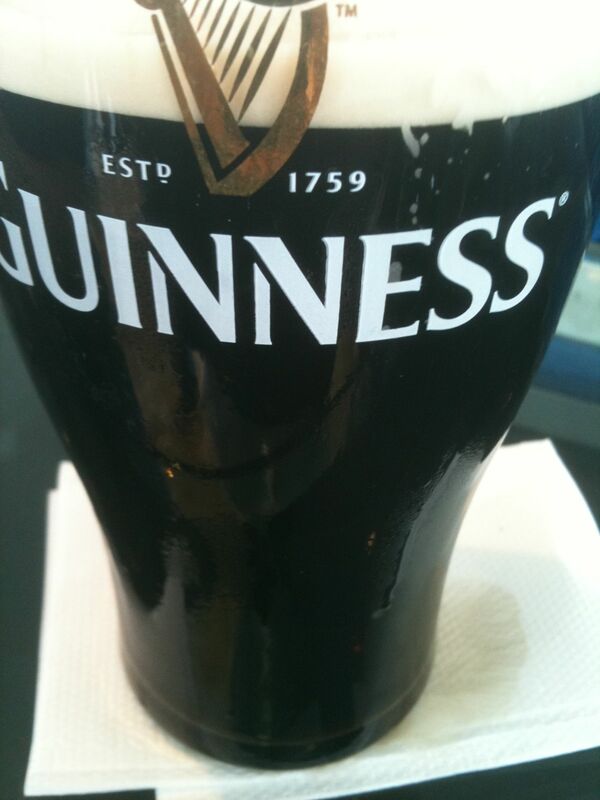 Well, I might slip in a wee bit of Guinness. So, off to the store. I want to use lamb, but so far I’ve only seen the little ones shipped from New Zealand, the lands of Hobbits and Elves, and that’s a bit too much petroleum for my taste, but lo and behold, I arrive at Whole Foods and they have Lamb Shoulder, bone in, from Capra Farms in Goldthwaite, Texas (west of Waco). On their website they state “We pride ourselves on our sustainability, traceability and good stewardship from farm to fork.” This looks promising. Their lamb of choice is the Dorper breed. These lambs are extremely hardy; they begin to graze on their own within the first few weeks of their lives. And, the ewes are very good mothers, both protective and nurturing and providing ample nourishment to their young. The lambs spend the first three or four months of their lives next to their mothers before they are weaned and placed in separate pastures along with the other lambs of similar age. Not only does this encourage the lambs to eat on their own, but it gives the ewe a chance to recover and get back to “eating for herself.” Now on their own, the lambs are left free to grow and develop fully. The lambs are not castrated, and their tails are not docked. They are given no antibiotics nor growth hormones. These animals are well adapted to natural growth… we leave them alone and allow nature to take its course. At about 90 pounds, or 5-7 months of age, the lambs are gathered and harvested in nearby Goldthwaite. Enough said, I purchase two pounds, a six-pack of Guinness and return to the black granite. 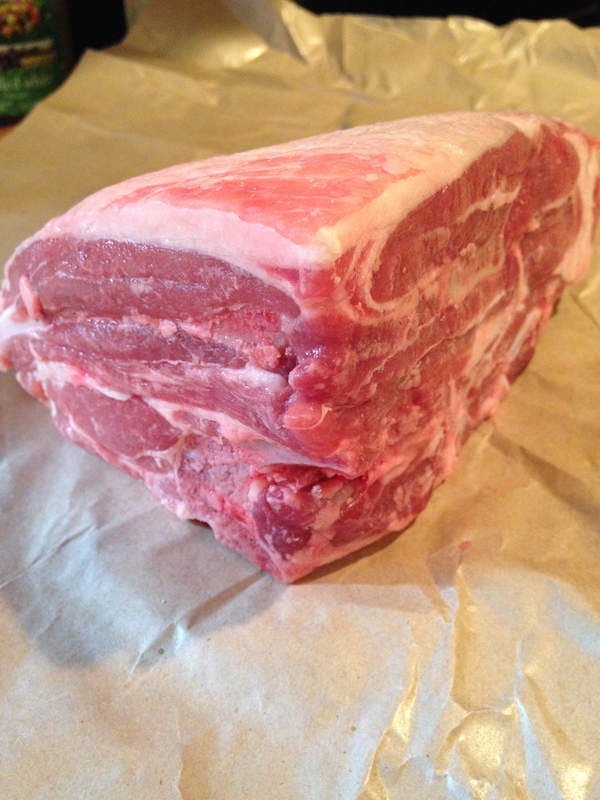 A nice layer of fat on top, and excellent marbling throughout. What am I going to do with this silent lamb? Well brown it, of course. 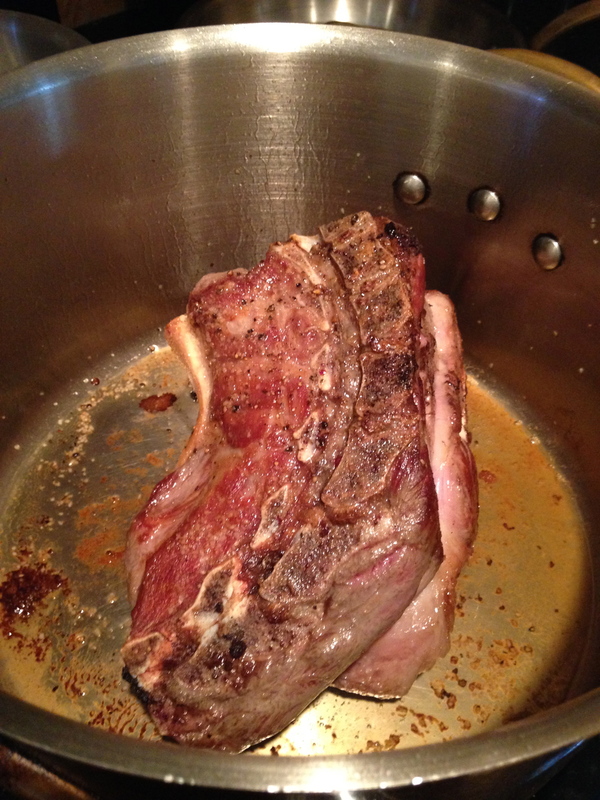 In bacon fat. Look at the color, look at those bones. I may have fallen in love with this lamb. 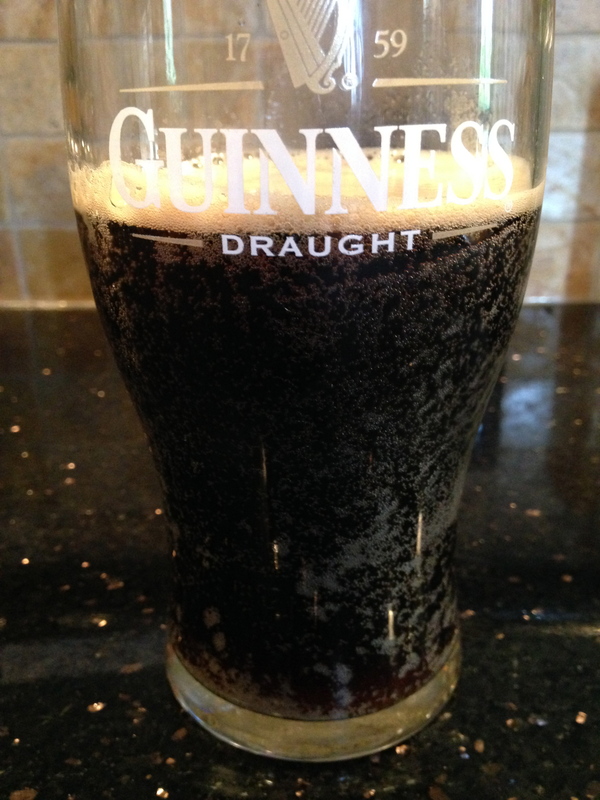 I pour in a little Guinness to scrape off all the wonderful browning, sticky parts. Next, it’s on to slicing up several onions and potatoes and burying the lamb, as well as drowning it with water. The onions and potatoes arrive with the friendly Greenling driver, brought from Fruitful Hill Farm in Bastrop County and Gunderman Acres in Wharton. At Fruitful Hill they offer produce, eggs and meat goats. Here’s their statement about chicken farming, which resonates with Joel Saladin’s approach in Virginia of using grass, animals and sun to create a vibrant soil (read Pollan’s The Omnivores Dilemma on Joel Saladin’s organic farming). We use no chemicals or hormones with our chickens or our pasture. We move the chickens about once a week to a new section of pasture so they get new grass and bugs to eat. An “eggmobile” is moved along with the chickens so that they have a place to lay the eggs, and some protection from the wind and sun. Moving them across pasture also provides for a more evenly distributed return of fertilizer to the soil. Their diet is supplemented with a high-quality high-variety feed and organic vitamins and minerals. At Gunderman Acres they grow a range of organic, seasonal and sustainable crops on 400 acres, which they sell at Urban Harvest and Imperial Farmer’s Market. There’s definitely a Texas-taste to this Stobhach Gaelach. Throw in some parsley and let it cook in the oven at three-hundred degrees. Meanwhile, I’ve liberated a few bottles of black gold. I remember my first Guinness in Dublin at the top of the Guinness factory, all Guinnessey in its Guinnessness like the first Guinness. 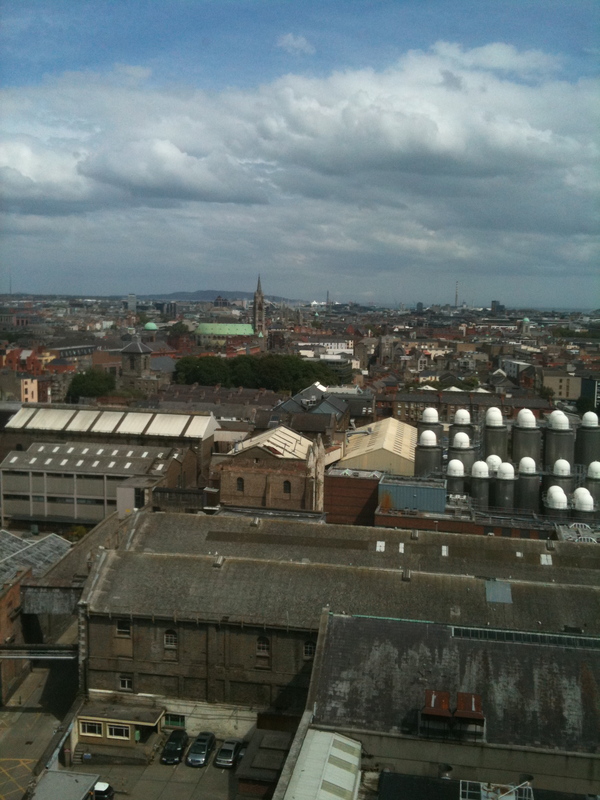 Here’s the pint and a view of Dublin from that paradisiacal height. Look at that glass of night, oil, dark matter, cacao, the deepest and darkest roast of coffee–a stout only an evening could love. Sorry. Where was I? 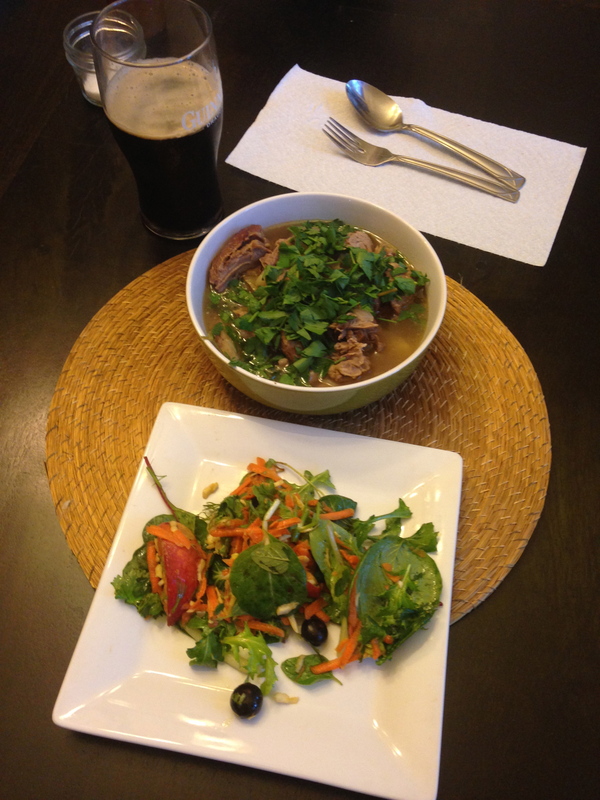 Oh yes, lamb stew. 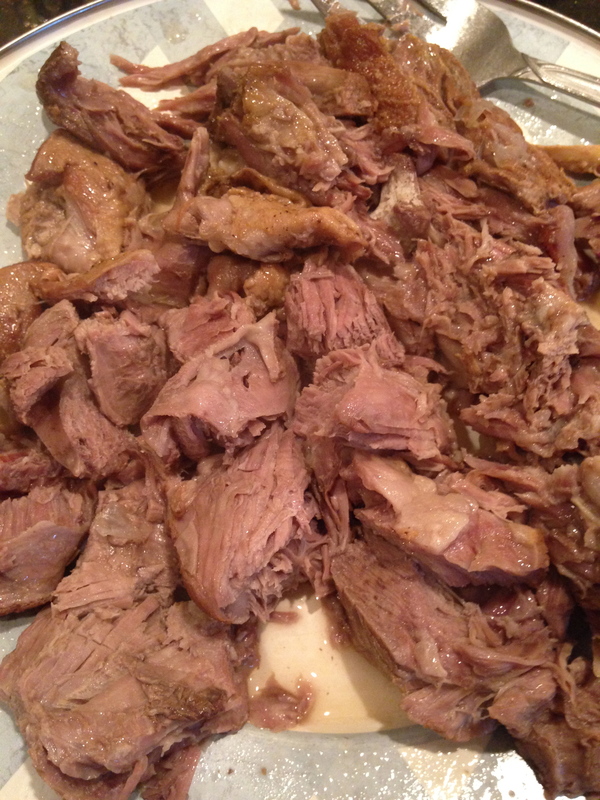 I’ve removed the lamb and it simply falls to pieces, much like Patsy Cline when you’re away. And this is the final look. 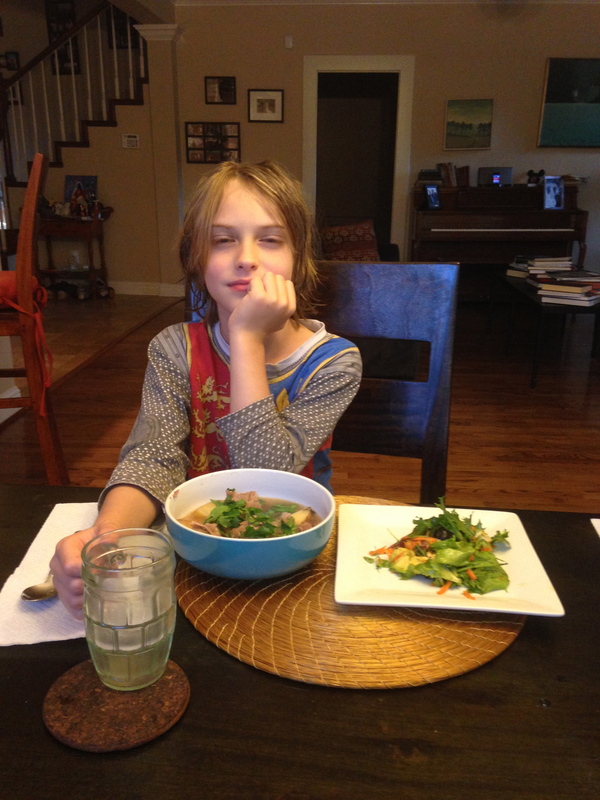 Here’s Gabriela’s thoughts on the stew and the salad she creates. When I looked at that brown, bubbling potato and meat stew, I remembered those kinds of stews in Sweden. Thick, brown sauce, potatoes and lingonberry jam on top. 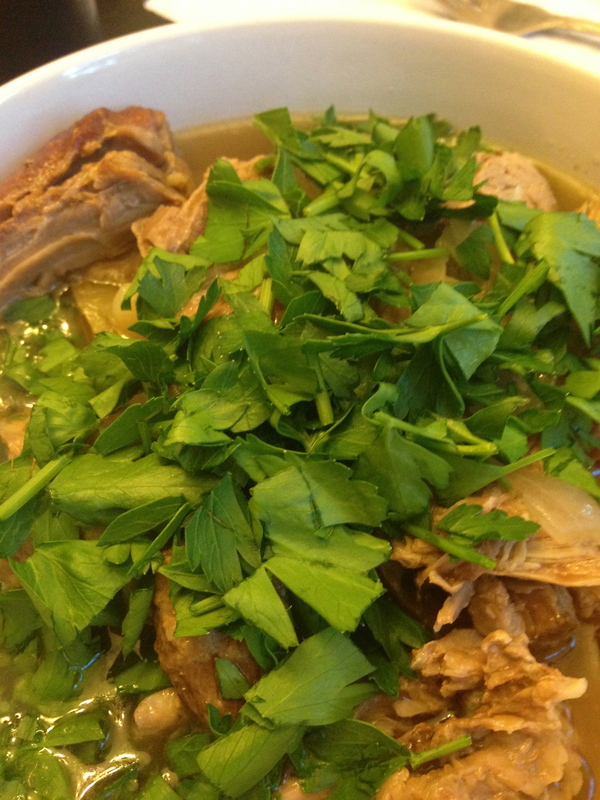 I loved that combination of tart-sweet with the salty broth. 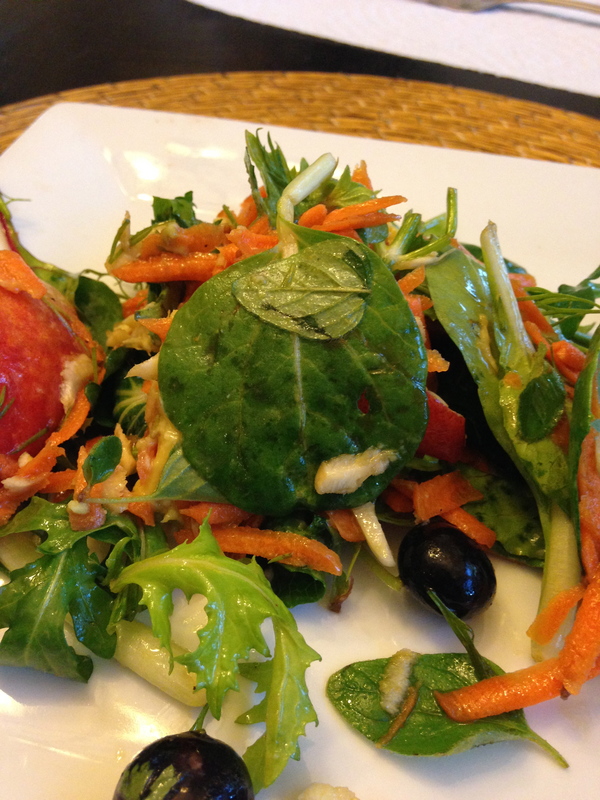 So I decided to make a fruity salad to go along with John’s Irish stew. The dressing was a variation on the usual: chopped garlic, olive oil, balsamic, salt and a bit of sugar, then a dollop of orange marmalade (the only jam we had). The vegetables: grated carrot and parsnip, because John hadn’t used that in the stew, spring leaf mix, fresh oregano, dill and thyme, avocado, and to enhance the fruitiness, peaches and blueberries. Not exactly the equivalent of lingonberry jam, but it worked nicely. In another incarnation, I might add some sheep’s feta. And with all said and done, here’s our table. 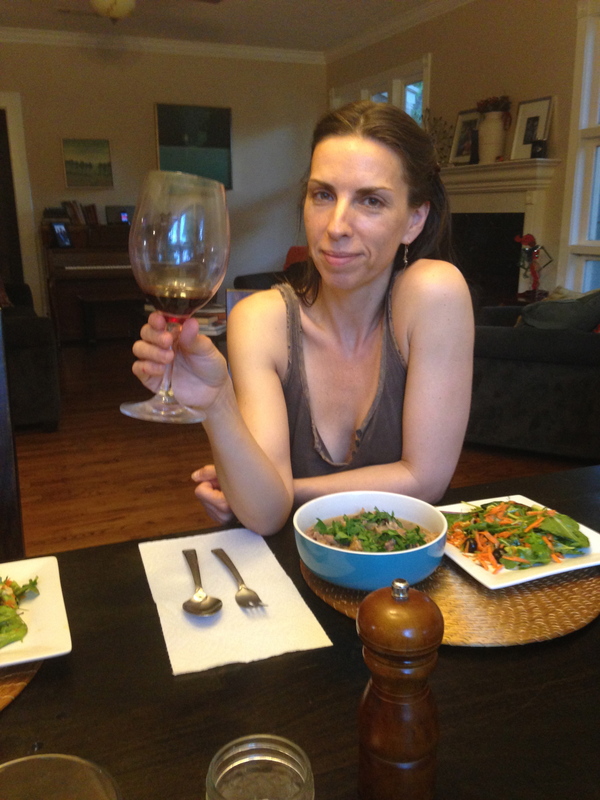 Gabriela adds: I asked if we should read some Ulysses after dinner, but Demian said no. He did not want to take a break from The Lord of the Rings. Understood. The chamber was filled with a soft light; its walls were green and silver and its roof of gold. Many Elves were seated there. On two chairs beneath the bole of the tree and canopied by a living bough there sat, side by side, Celeborn and Galadriel. They stood up to greet their guests after the manner of the Elves, even those who were accounted mighty kings. Very tall they were, and the Lady no less tall than the Lord; and they were grave and beautiful. They were clad wholly in white; and the hair of the Lady was of deep gold, and the hair of the lord Celeborn was of silver long and bright; but no sign of age was upon them, unless it was in the depths of their eyes; for these were keen as lances in the starlight, and yet profound, the wells of deep memory. Next Next post: From Small Goat Farms To Megafarms: The Shared Reality of Urban and Rural America.